I’m a big fan of Elena Vaitsekhovskaya’s interviews, she always asks great questions with deep understanding of figure skating. Here’s a translation of her recent interview with Sergei Voronov. About his parting with Tutberidze, moving to Goncharenko, hard season and plans for the future. I’m sorry for my English, and I’m sure Elena Vaitsekhovskaya could do a way better translation, but I think that bad translation is better then nothing. And I know that Sergei has a lot of fans, who are interested what is going on with him. So, I’ll try my best. When at end of February you were skating in Saransk at the Russian Cup Final, grinding out every gesture, it was difficult to avoid the feeling that it’s your last performance. Sergei: To some extent your feelings are correct. That competitions were incredibly hard for me: I was very well aware that if it’s not the end of my career, then absolutely for sure my last performance with a former coach. We’ll immediately part forever. This thought prevailed everything else and of course, didn’t add a good mood. On the other hand, I have been preparing for that competition very seriously, even though I have been preparing almost single-handedly. I understood, even not going to the European Championships in December the season isn’t finished yet, even though it turned out very badly for me, I still need competitions. And it didn’t matter that these competitions haven’t any special significance? Sergei: I‘m convinced that athlete must perform in order to remain competitive. At least in terms of banal competitive practice. At what point of the season you started to understand that everything went wrong, and you can’t do anything about it? Sergei: I think my first mistake was to go to Canada for new programs. It was done too late – in mid-July. Jeffrey Buttle and I simply couldn’t match our schedules: first he was ready to work with me, but we had a training camp planned in Novogorsk, then Buttle hadn’t a free time, so, I had to adjust to his schedule. And then you realised that the program didn’t turn out? Sergei: I can’t say that they didn’t turn out. Rather, it was “a trouble never comes alone”. By themselves, programs were interesting, I don’t tend to consider short program as a failure, but maybe I have simply failed to reveal the free program. I think we not quite guessed with the music in this program. Apart from skating I liked it very much, it was very well arranged, but … You know, it’s like with clothes: it can be stylish, expensive, fit in size, but like a round peg in a square hole. Absolutely true statement, if people have decided to work together. Sergei: I agree. But I’m 28 years old not 15, and I’m able to feel when the working relationship cease to be working. Therefore, I sought to understand what happened and what I did wrong. Did you manage to find the reason? Sergei: To be honest, no. Although, I’ve thought about everything. We have never had any financial misunderstandings, but then what? World Championships in Shanghai, where I took thirteenth place? Maybe. And maybe from the beginning I was considered as a good sparring partner, who after some period of time become needless. In this case, sadly, but I need to admit that I turned out to be a fool, because from a very beginning trusted a coach fully. But I don’t regret about the period I’ve been working with Tutberidze. In the end, my best results I showed with her. In figure skating parting with coaches is usually held on the same pattern: first athlete agrees on cooperation with a new coach, and then notify the former. With you it happened vice versa. Sergei: Yes, and not for the first time. In 2013, I parted with Nikolai Morozov and then for a month hadn’t knew what to do next. This is a very unpleasant state: at that time I have understood, that any, even the most lousy certainty is much better than the lack of certainty. Because in this case, you think only about one thing: the bridges are burned, and you have nowhere to go. And you went to Goncharenko? Sergei: Yes, not knowing her at all. Before we have started working together, we just said hello meeting on various tournaments. I really liked that Inna Germanovna is very straight person, as I am. 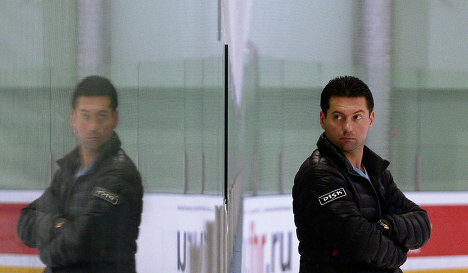 Perhaps, this is why we immediately come to an understanding, although, I must confess: a year ago, I was absolutely sure that Tutberidze – is the last coach in my career. But life never stops to amaze – including the “household” side: who would have thought that at the end of career I would train close to home and have an opportunity to take a shower between workouts and to rest normally? I have learned to enjoy some simple things. For example, leaving the house it’s not necessary to look on navigator to find out: I’ll be on the rink in two hours or 2.50? To go through the center, or by the Ring Road at the opposite part of the city? The only thing I had to get used to – early wakeups. But it’s also a plus because when we skate at competitions we often have to train early. So, having decided to continue a career, you want to prove the former coach that it’s early to write you off? Sergei: It’s not that. In general, I think it’s meaningless to prove something to someone but yourself. Just in my head I still have Tatiana Tarasova’s phrase, that she said at the Russian Championships, where I became fifth: “That’s not how the career should be ended.” I absolutely agree with her. I don’t want to live the rest of my life thinking that this situation broke me. Do you think the most difficult thing in figure skating is to sit in the “Kiss-and-cry” after you lost to one, another, to fifth, tenth? No. The most difficult is to get up the next day and to force youself to go to the rink again. Like in boxing: you knocked out and you get up and continue to fight. It’s much easier to take the decision to quit. Don’t you cunning? Let’s pretend you’ve quit. What would you do then? Sergei: The most banal thing that comes to mind – to earn money by training kids. Is it a good income? Sergei: It seems good to me. At least for the time, you haven’t decided yet about further profession. In order not to think where to get money for gasoline. I don’t exclude that I’ll want to start education. In other words, you haven’t fear to leave the sport? Sergei: Everyone has such fear, not matter what he says. In a sport you start to be very accustomed to the fact that you don’t need to think: everything is setted, there is a clear timetable, calendar. Although, organizational issues have never been a problem for me. Rather I always like to plan vacation: to seek routes, tickets, negotiate about the living and so on. On the whole, it seems to me that I’m not so narrow-minded person to get lost in life after sport. In any case, I believe it. As for figure skating, maybe I’m not estimating myself adequately, believing that I still can achieve something in sport. But then again, why not to try? What I risk in 28 years? I’d rather regret what I did, than lament about what I didn’t do. At least I won’t be ashamed to sit in the “Kiss-and-cry”, if I understand, that I did everything I could. Every athlete feels such things really good at heart. When Inna Germanovna agreed to work with me I asked directly whether she sees sense in this work, can I show something new on ice? She replied affirmatively. After the first training even said: Sergei, you’ve always been a cool skater but we’ll try to do even better. And if the answer turned out to be the opposite? Were you ready to hear it? 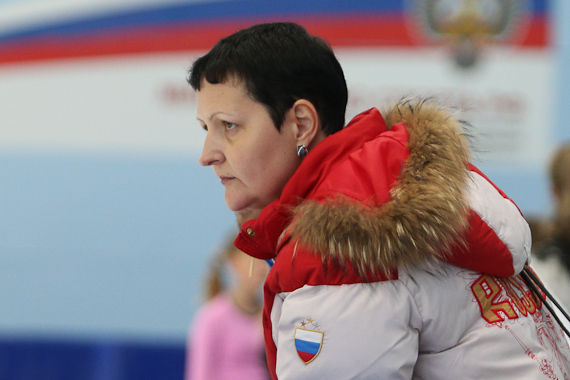 Sergei: I’ve been already told to my face that I’ve been over as a skater long time ago. Nevertheless, I continue to skate. And I have a simple attitude to such opinions: each person should have the right to have his opinion, but I may not to agree with it. I know that in terms of training exertion Goncharenko is a very tough coach. Sergei: Tough, it’s true. With a very strong character. This I had a chance to feel pretty good, but I’m not scared. We really train a lot: in the athletics arena, and in the gym, and the choreography is very strong. I even began to receive compliments that I’m so thin and tight. I’ve realized it already training with Tutberidze that in my case only descipline can give the result and nothing more. In youth you can compensate some things with energy and talent. But with age it stops working. Therefore, I now concider my body as a machine: woke up, started the engine, warmed, fueled – and let’s go. Plus, training gives me a drive, a pleasure. When you skate with 15-16-year-old athletes, you also feel so young and full of energy. There is no feeling that you’ve faced the limit of your possibilities. Not to mention the fact that every day I learn something new, I start to be interested in things that people of my age usually not interested already. Sometimes I think that I would be a good dad when I’ll have a family. I can do a rubber bracelet or to explain a computer game. Have you felt jealousy to the coach from her main student Elena Radionova? Sergei: It seems no. Of course, I asked Goncharenko how Elena may take my appearance in a group and received an answer that it’s no problem. For me, it’s no matter who skates beside and what he thinks about me. I earn my place on the ice by my own work. Have you already set the goals for the next season? What to strive, what to learn, in what concept to make the programs? Sergei: It’s a bit early to talk about any specifics. I am fully aware that “to make me better” means to pinch me even more in terms of training and discipline. I’m ready for it. Unfortunately, we had too little time to change something before my performance at the World Challenge Cup, but we have already started to work a lot on skating skills with Sergei Verbilo. I’ve never skated so many “layouts”. Generally, I start to learn how to skate from the beginning. Haven’t you skated layouts in your former group? Sergei: We skated full programs, with all jumps. It’s a different things. Layout it’s first of all skating, not jumps. So,completely different warm up. When I did it for the first time, I really had a feeling that I’ve skated three free programs in a row. I didn’t pay much attention to spins. Now, I understand that each element it’s either a plus into your “money box” or a minus. Therefore, we pay much attention to spins, edges, correctness of these edges. I’m very sorry, that when I started skating, it was absolutely not common to skate “figures”. This is – a huge omission. Still, the most important for the skater to stand well on skates. If you are skilled in jumps, somehow you will jump. But you have to learn how to stand on skates correctly. Who will do your new programs? Sergei: At least one of them – Nikolai Morozov. Sergei: You know, when in 2013 I decided to leave Morozov’s group and came to say goodbye, he told me: “Sergei, life is long and it’s stupid to spoil relations just because you decided to go away.” Only in time I realized how right he was. I’m still can call Nikolai at any time and consult with him on any question. I think, he gave me a lot – own understanding of skating and music. Therefore, I appreciate the opportunity to work with him – like a choreographer..
How do you generally asses what is happening in the men’s figure skating now? Sergei: Of course, I’m not blind, and I don’t have blinkers like a horse. In that sense, I see very well how quickly things progress and how the competitors improved. But I’m focused solely on myself. By the way, I remember very well, how Gabriella Papadakis and Guillaume Cizeron came from juniors to seniors. They not only haven’t really knew any of the leaders, but didn’t seek to know. It was really cool: all-consuming focus on themselves and as a consequence – a unique result. Sergei: I agree. At the Grand Prix in Beijing, I was pretty much impressed by the appearance among the strongest Chinese boy Bojan Jin with his quad lutz. Actually, not by lutz itself, but by the fact that that he’s so gifted by nature that can jump everything. But what now? Sit in the corner of the locker room, fold hands and grieve that I can’t do it? The only question is, how big is your inner reserve for technical progress. Do you feel it? Sergei: I’m terribly sorry that at the end of the Olympic year, didn’t start to learn quadrupl loop – I had such thoughts. But noone supported me in the group in this idea, so the intentions have subside. I already talked about this with Goncharenko and I think we definitely should try to learn a second quad. It’s interesting for me, and can’t say what is more cool: quad lutz, which Bojan Jin is doing in his 19 years, or to learn a new jump when you’re 28. The most important thing for me now is that I really want to work. I want to go on the ice and to show this work. And to compare – it’s to those nine who sit along the board.